Comments Off on #Officefortheday Pre-Order push! On February 14th, 2016 – three days before I left for Navy Basic training – I brought The Tyler Mire Big Band into the studio. With only five hours we managed to record eight new compositions we had been performing regularly in the preceding months. What happened was an inspiring performance from the band. I then said goodbye to Kelsey and took a flight to Chicago where I began a very fun 8 weeks at Recruit Training Command… While in basic training I communicated with Kelsey through letters and phone calls. With Jeff Coffin’s help, she was able to get the remaining flute parts recorded. After graduating from basic, I moved to the DC area. The album was worked on when I could find time and money. I was able to come back to Nashville two times (Summer 2016, Feb 2017) to do some mixing with the great Brendan Harkin. I’m happy to announce that I am finally in a position to get this done by the fall. 1. So fans can get mixes and goodies early. 2. To help fund the expensive post-production of an album. By donating a “mire” $15 bucks you can pre-order our CD. Signed and mailed to you! -Get access to a private Soundcloud playlist of the entire album right away! Be the coolest kid on the block while you listen in your Beats by Dr. Dre. Wanna see us in action? I’ll cut and splice some video clips from the session and post them for you all to see. Photos by the great Graham Gerdeman from our Feburary 14th session and Feb 15th final Family Wash performance. Convinced? Click the button below! Or you could buy some charts, which are available on my site here or on Maxwell Tree Music. In the coming weeks I will be adding the newest charts to my online store. Stay tuned! 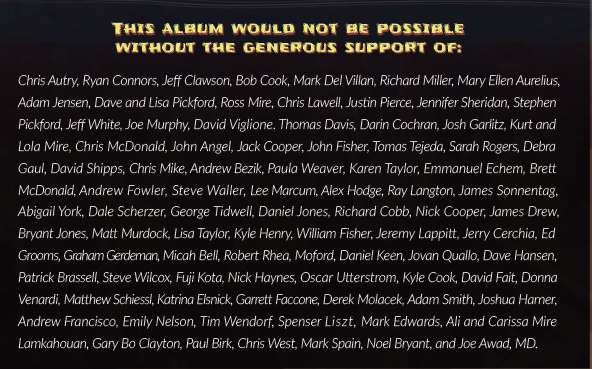 All donations, CD sales and Chart sales will go directly to the 3rd album’s post production fund. Thank you all! And now I’ll leave you with a sampler of the coming CD. I hope you enjoy our new recording, #Officefortheday. Posted in: News This entry was posted on Monday, June 12th, 2017 at 8:00 am You can follow any responses to this entry through the RSS 2.0 feed.